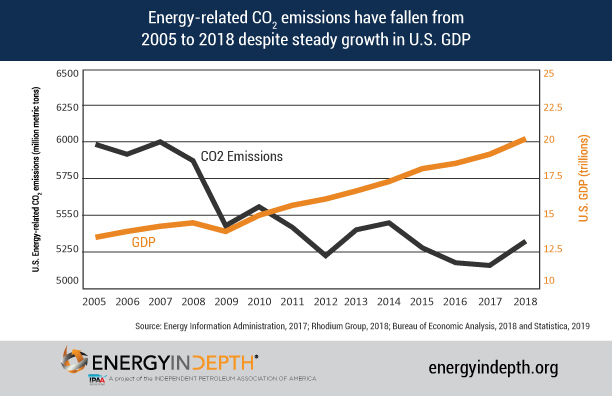 A recent report indicating a potential one-year increase in 2018 U.S. energy-related carbon emissions requires some context to consider whether there’s any cause for alarm. 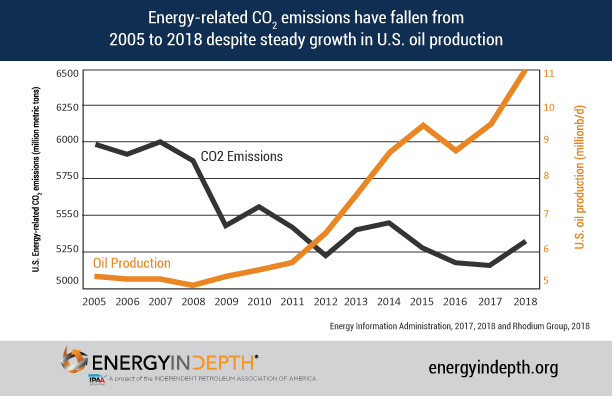 Based on a few long-term trends – along with the authors’ own statement that “we don’t expect a repeat of 2018 this coming year” – the answer appears to be “no.” CO2 emissions from the energy sector have still fallen 11 percent from their 2005 peak, despite sizable and dramatic increases in oil and natural gas production, population, the number of vehicles on the road and the nation’s GDP. The new preliminary analysis from Rhodium Group – the Environmental Protection Agency’s Greenhouse Gas Inventory (GHGI) will not have 2018 figures available until 2020 and the Energy Information Administration will not release it’s 2018 U.S. 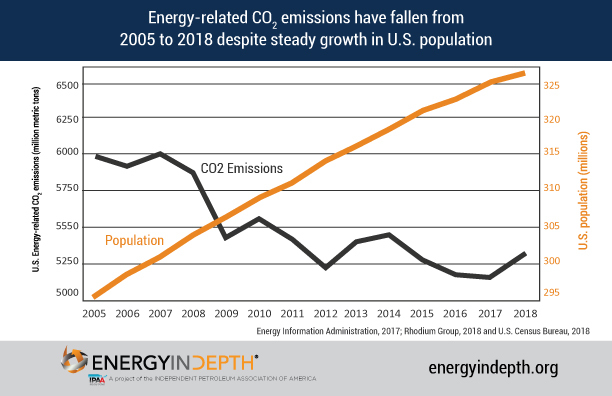 Energy-Related Carbon Dioxide Emissions report until September – found U.S. energy-related CO2 emissions potentially spiked 3.4 percent in 2018. This includes an estimated 34 million metric ton (MMmt) increase in emissions from electricity generation. But here’s a critical detail: the switch to natural gas is responsible for 61 percent of the total 3.86 billion metric tons of electric generation CO2 reductions from 2005 to 2017, according to EIA. In other words, a 34 MMmt increase is less than 1 percent of the total reductions that have occurred in this sector since 2005. Here are a few other ways 2018 compared to 2005 – the starting year for emissions reductions goals set by the Paris Agreement. Thanks to the shale revolution, the United States has been shattering oil and natural gas production records. 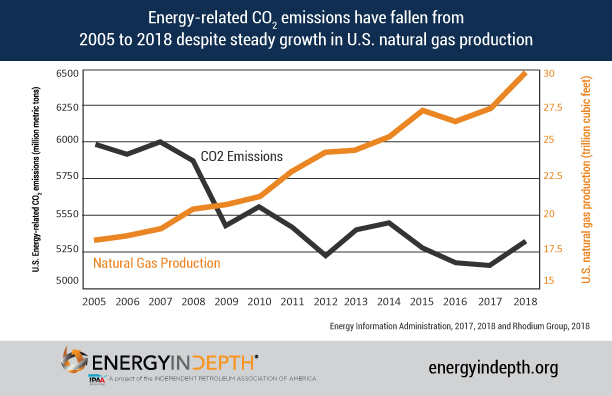 During the same time Americans saw a more than 11 percent drop in energy-related CO2 emissions, oil and natural gas production increased by 177 percent and 68 percent, respectively. The U.S. economy has also improved since 2005 – U.S. gross domestic product increased nearly 49 percent by 2018. The U.S. population also grew more than 11 percent between 2005 and 2018. Notably, the transportation sector has been the largest source of U.S. energy-related CO2 emissions for the last three years and grew by 1 percent in 2018, according to the Rhodium report. 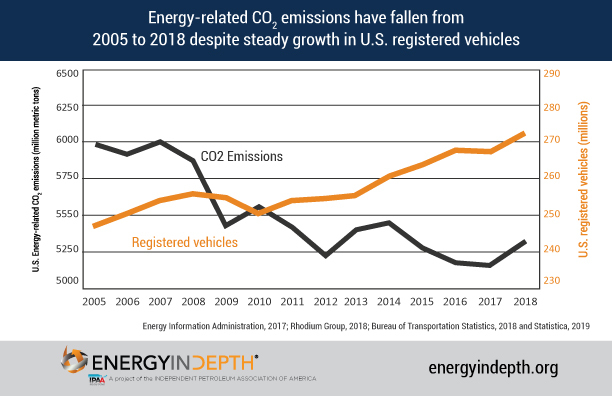 From 2005 to 2018, the United States added 10 percent more registered vehicles on the road, yet reduced total energy-related CO2 emissions by more than 11 percent. At a time when the U.S. economy and population are growing, the number of cars on the road is increasing, and America is producing a lot more oil and natural gas, a single year-over-year increase in CO2 emissions pales in comparison to a 13-year trend in reductions. Thanks to innovative technology, collaborative efforts and an abundance of natural gas available for electricity generation, the oil and natural gas industry has helped to set the United States on a trajectory to achieve its Paris commitment ahead of schedule.